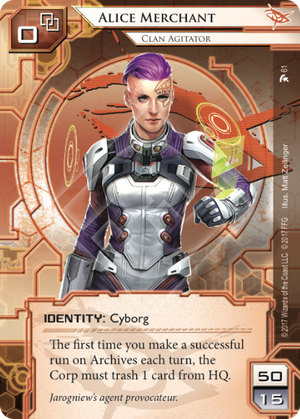 When Alice Merchant makes a successful run on Archives, does the Corp trash a card from HQ before or after the Runner accesses cards? A second archives focused runner. It's useful to compare her to the crazy old man. Aside from text wording the big differences are that Omar has 12 influence compared to Alice's 15 but Omar only has a standard 45 card deck size minimum whereas Alice has 50 minimum. With regard to effect both have a good deal when getting into archives but only once per turn. Omar lets you sneak from archives into R&D or HQ whereas Alice forces the corp to discard a card. The way I read Alice's ability the corp gets to choose (it doesn't say "at random") which is a bit of a downer. On the other hand because the ability of Alice doesn't require triggering by paying a click it combines well with run events. In effect I expect both Alice and Omar to force the corp to put ice on archives. Most corps will do that against anarchs anyway due to Keyhole and other anarch cards that force cards to be trashed. One thing Alice does do better than Omar and most anarchs is to support a "trash the corp" style where the goal isn't so much to score agenda's directly as it is to sabotage the corp's strategy by making them bleed their essential cards into archives. In a post-Jackson world even the old mill strategy may see a revival: win by making the corp have no R&D left. In such a strategy the runner does not need to actually access HQ, just preventing the corp from setting up a secure enough scoring server or the infrastructure for fast advance is enough to win. I guess that may be the best way to view Alice: an offensive sabotage specialist. It will be interesting to see if this strategy will work in the wider meta. Hand Ob(or De-)struction is something most corps can't deal with. Her ability is a fruitful package of disruption and archives pressure. It's true, the discard isn't randomized, but considering that 1. It will often trigger early, when the corp has not had time to develop yet and 2. As the game progresses, you will often find the Corp without many cards in hand, making every discard painful. In fact, the reason why I enjoy her playstyle so very much may stem from the fact that she bears certain similarities to my all-time favourite corp identity, Jinteki: Personal Evolution. Both warp the opponent's playstyle to a degree, by denying them cards they would usually have access to, thereby making their game plan unreliable (this is especially true forcombo decks). But whereas PE is reactive and relies on traps and forcing decisions, Alice is proactive and terrorizes the corporation at her own behest. And running is where she's good at. Since you already have an in-built archives pressure, you will traditionally want for HQ and RnD threats, since Anarchs have a bit of a harder time entering remotes. Medium and Bhagat (Alice lends herself nicely to a resource-intensive build, so [[Career Fair]] is a solid pick), with additional cards that reward running centrals ([[Datasucker]] and [[Tapwrm]]) being rock-solid includes. Overall, an incredible addition to the game and, as the poets say: "You can run the Jewels, or lose ya fingers."